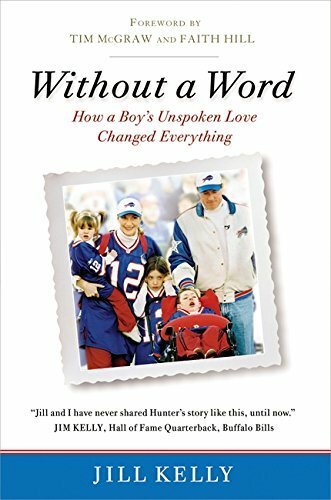 Without a Word: How a Boy’s Unspoken Love Changed Everything, tells the story of the life of Hunter Kelly, a boy born with a fatal genetic disease called Krabbe Leukodystrophy. In 1997, when Hunter was born, the average life expectancy for a child born with infantile Krabbe’s was a mere 14 months. Hunter defied these odds and lived to see the age of eight. Author Jill Kelly—with a foreword by TimMcGraw and Faith Hill—pours out her soul page after page, telling the story of her journey and Hunter’s—of the gut-wrenching pain of her and her family and their love for her son. There are many moments where even the most stoic reader will find him- or herself reaching for the Kleenex. But the book is about more than the story of Hunter, his sisters Erin and Camryn, and their undying love for their son and brother. It is also about the troubled relationship between the author and her husband, a man by the name of Jim Kelly, who happened to quarterback the Buffalo Bills to four consecutive Super Bowls in the 1990s. And it is about even more than that. Jill finds Christ in the midst her despair. Initially, Jim merely tolerates her devout lifestyle, but eventually, he, too, accepts the Lord into his life as well. As that happens, their relationship strengthens (they actually renew their wedding vows toward the end of the book), though Jim is first compelled to reveal his serial infidelity to cleanse his soul in search of forgiveness from both her and God. The premise of the book is that God revealed himself to them through Hunter for a greater good, though their remaining life on Earth will forever be tainted by the loss of their only son. that God did through his brief and incredible life. Because I’m missing the boy whose unspoken love . . .
Changed everything . . .
Kelly can be very good when she is writing lyrically. However, there are some problems with the storytelling itself. Kelly’s account is choppy. She includes a brief take from Jim at the end of a few of the chapters, in the middle shifts solely to her journal entries for several chapters to capture the events of Hunter’s life, tosses in letters and miscellaneous thoughts from those close to them, and then moves back into first person to bring the book to a close. There are some other problems, as well. The details of their initial wedding seem a bit out of place with the overall message of the book. It is hard to believe that she is so naïve as to get into a relationship with an NFL quarterback with a party-guy image who proposes to her yet makes her get rid of risqué pictures of previous flames, and it is equally trying to accept her claims of a terrible marriage while she at the same time seems to enjoy the celebrity by embracing aspects of it through things such as her repeated us of the term “Team Kelly” when describing events like their over the top tailgate parties. This may seem like nitpicking, especially in light of the awful tragedy they endured with their son, and it might not be worth mentioning if one of the main points of the story of Hunter’s life weren’t their journey to find God and the eventual mending of their relationship. There probably needs to be more about their actual relationship both before and after they wed and of Jim himself throughout the book if the reader is supposed to care about their renewed love for each other at the end. That aspect of the book muddies the waters. The elements of a mother’s love for her child, and Jill’s acceptance of Jesus into her own life, come through much better.